Last year at the Northwest Tea Festival, we got feedback that some of the attendees would like more advanced classes. This year, I have the honor of being the exclusive presenter of advanced classes. I’m hoping that they fill quickly and show the world that American tea drinkers are serious about tea and interested in more than introductory-style tea education. The classes will be offered in two pairs of topics. Each topic has a beginner level (free) for those who are newer to the topic and as orientation for the advanced class. The advanced level (with registration fee) will take the topic further, looking at the real story behind the often oversimplified claims used to sell tea. The first pair of classes will be called The Teamaker’s Art and both will shed light upon how the leaves you take home from your local tea shop are grown and processed. My goal is to have you leave not only knowing what goes on at major points in tea processing, but also have a deeper understanding of the complex skills and artistry required to make a truly good tea. Teamaker’s Art 1 (Saturday, Oct 3rd) will look at the various choices made by a teamaker from soil to finished tea. Teamaker’s Art 2 (Sunday, Oct 4th) will dig even deeper into the subject and explore how selected processing steps and the choices made by the teamaker affect the internal chemistry of the leaf and, consequently, the experience of the tea drinker who brews it. The other pair is Tea and Caffeine, although both classes will touch a bit on plants other than Camellia sinensis and a few molecules besides just caffeine. Here my goal is to shed some light on the complexity of caffeine, especially when the source is the tea plant. Tea and Caffeine 1 will mainly look at what caffeine is, what it isn’t, and dispel several of the most pernicious tea myths in circulation. Jump then to Tea and Caffeine 2 to learn how caffeine works its magic in the brain, how it combines with other compounds in tea to cause sometimes unexpected effects, as well as look at some recent research into the health risks and benefits of caffeine. Anyone can take either (or both) levels. If you jump into the advanced one without taking the first one, it will be more challenging, but don’t let that keep you away! What’s Up With Tea Geek? First, I’ve upped the security in the Tea Geek Store and installed regular credit card processing, so now you can sign up for classes and buy the tea for your daily cup (or special-occasion cup) quickly and with more confidence. Perhaps more importantly, I’ve added another membership level that you can join: Business Members. Designed with the training and reference needs of people in the tea industry in mind, it ties my original purpose in founding Tea Geek to the results of all my study over 15 years learning about tea and launches the Tea Library Service. After studying tea for many years and working in several tea businesses, I realized that there was just too much misinformation circulating about tea. And the tea industry in the US (a) didn’t care, (b) didn’t know what they didn’t know, and/or (c) were being somewhat careless with “facts” in order to move more product. So I founded Tea Geek with the intention of providing accurate, well-cited information about tea, primarily through tea education classes. Your own discount code for 15% off everything offered by Tea Geek–classes, tea, teaware…everything! Your own unique discount code for 20% off everything offered by Tea Geek–classes, tea, teaware, research…everything! Your employees can become Individual Members for only $25 each (a $35 value per person). Great for an inexpensive employee benefit or training program. Quarterly tea samples; try something new! Quarterly tea report on various aspects of tea. Topics may include trends in the tea industry, tea history, processing, geography, chemistry, health studies, and more! Access to Tea Geek’s Tea Library. 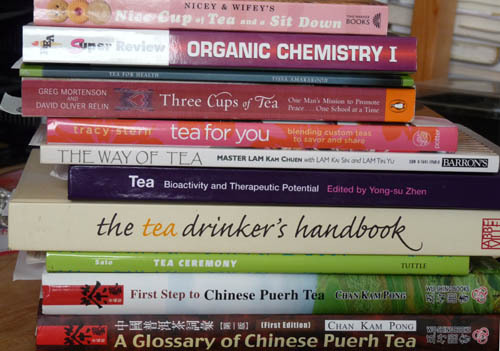 Select tea-related resources and have them shipped to you to review or use as reference! And a FREE online class! Tea 101: Everything You Need to Know will get your new hires up to speed quickly on the absolute essentials to get started in the tea industry. In addition, we’re scheming up new benefits for our members and have several knowledgeable tea people designing new online courses (some will be free to members, and the rest will be 15% or 20% off the non-member price). With the creation of classes, research for the Tea Geek Wiki, putting together the Tea Library Service, updating the website security, and adding credit card processing, it’s been a busy couple of weeks. Remember that the money from your memberships will be used primarily for expanding the Tea Library and, soon, original scientific research into tea. 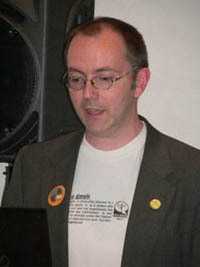 Posted on 17 September, 2009 17 September, 2009 Author Michael J. Coffey1 Comment on What’s Up With Tea Geek? For those of you who have determined the precise temperature at which your favorite tea gives off your favorite aromas and flavors, but want to get to the perfect temperature more quickly than allowing the water to cool off the boil naturally, I’ve got a refresher course for you from high school chemistry. Now, don’t run–it’s pretty easy. Well, it’s easy mainly because we’re talking about adding water to water (so there’s no worrying about different thermal properties of two different liquids). We’ll also ignore for the moment the effects of surface area on cooling and the heat transfer coefficients of different materials you might hold your water in. See? We’re ignoring all the confusing stuff and making it simple. Let’s say you’ve got some amount of boiling water (212F) and another amount of room-temperature water (68F) and you’re going to add the cold water to the hot water to make this perfect tea-brewing temperature. Now, 194 isn’t much below 212, so we probably don’t need to add too much of the colder water. We can use an equation to figure out the resulting temperature based on the amounts of each of the two waters we combine. Here’s the equation. Don’t be scared. For the moment, let’s pretend we’ve got a teapot or cup or gaiwan or whatever that holds 8 fluid ounces. And to make the math easy, we’re going to measure in 1-ounce increments. Since we only need a little cool water, let’s do 1 ounce cold, and 7 ounces hot. What temperature would that make? Once you’ve used this equation to figure the right proportions, you can make the right temperature all the time without resorting to the use of lots of thermometers or devices that heat water and shut off at preset temperatures or whatever. If 194F is your ideal, you just need to remember that if your cold water is really at 68F, it’s a precise ratio of 1 part cold, 7 parts boiling. Clearly, you can also adjust based on whatever the situation is. If you keep bottled water in the fridge and the fridge stays at a more constant temperature than “room temp” you can use that number for your cold and find your new perfect ratio. If you want to get more complicated, recognize that different materials absorb heat at different rates. However, the closer the water vessel used to combine your two temperatures is to the final temperature, the less the effect will be. So your calculations will be more accurate by pre-warming your vessels. Or if you’re geeky about temperatures even beyond what I’ve given you here, you can research the thermal properties of whatever material your teaware is made of. Of course, I usually use boiling water for everything, and drastically lower brewing time if it’s a “low temperature” tea. But that’s just my personal method. Do tea the way it tastes best to you, and experiment with other ways to see if you can improve on what you already like. I’ve been doing tea education for at least part of my income since 2003. I’ve encountered a number of challenges along the way and I’m curious if the tea people here would have any good ideas. It’s hard to get people to sign up for a class that they can’t even comprehend what it is, let alone why they might want to take it. Second, it seems that many people in the tea industry (again, my bias is the English speaking world, primarily USA) just don’t care about accuracy. It seems to me that the typical tea business person is very nice and very well meaning, but essentially read a few of the popular tea books such as Norwood’s New Tea Lover’s Treasury, realize how much more they know about tea than the average person, and then rely on their suppliers to tell them anything else they need to know. The end. Very few try to verify what they’re told. Very few actually seek out additional tea information. And so half-truths, mistakes (original, inherited, or amplified), little white marketing lies, and other forms of misinformation get circulated over and over again and become orthodoxy. That leaves an army of nice, well-meaning people who consider themselves experts out there, spreading lots of believable-but-incorrect information about tea. How does one responsibly educate about tea? How can tea people tip the balance towards accuracy? What can tea educators do to more effectively move people along the path so many of us have been on–from grocery store teabags to more quality teas, and finally to a place where we realize that there’s a ton of interesting stuff to learn about tea…and that it’s enjoyable to do it? Is good, accurate information something that the industry as a whole needs to work on providing, or is it something that tea customers need to demand? Or does it even matter if “experts” are teaching (and customers believing) stuff that just isn’t so? I have my own ideas on some of these, but I’m curious what others think. Leave a comment and let me know your opinion!